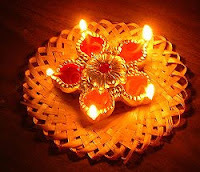 Diwali ( or Deepaavali) is one of the many festivals celebrated in India. It is celebrated by Hindus, Jains, Sikhs and some Buddhists. Its timing varies with the Hindi lunar calendar but in 2009 it falls now on 17th October. Coincidently the day I have invited some friends round prior to me leaving the UK. So what is Diwali all about? It literally means a 'rows of lighted lamps' and is commonly called the Festival of Lights in English. It is celebrated worldwide, wherever there are large Indian expat communities, eg in the UK in Leicester and Southall, London. As I look forward to it next year in India, I find out that it is a huge celebration lasting five days - bring it on! Houses are lit with hand-painted clay lamps (diwas), colourful rangoli drawings, and henna. It is a time when businesses pay off all debts, new clothing is purchased, gifts are exchanged, and food is celebrated, particularly dried fruit, nuts and in particular sweets - Indians it seems have sweet tooths to rival anyone's. Hilary tells me that in Orissa houses are blessed at this time. Tradition has it that it was the time when Lord Rama returned after 14 years of exile during which he fought and won a battle against the demons and the demon king, Ravana. People light up their houses to celebrate his victory and to welcome him back. So it signifies the victory of good over evil and the banishment of darkness. Pretty good stuff in my book even today. So let's hope we can rid the world of a few more evils in the coming here. With thy life and devotion"
Don't forget the fireworks. It is very very noisy here in Koraput with crackers and 'bombs' going off everywhere at all hours of the day and night. We stayed up till 2am this morning and it only really quietened down after midnight. It smells really strongly of burnt gunpowder. Not a good day for asthmatics! Those oil lamps look great but trying to set one up for the first time without any tuition got very messy indeed, especially using castor oil supplied in a flimsy plastic bag. Yes, very cool, Sheila. I share your hope. Gosh, I hope it does not take me 14 years to overcome my demons. I am in a bit of a hurry on that project. Sheila, those rangoli drawings are gorgeous! I don't think we have anything as beautiful as this going on here in the USA. Well, except maybe plastic santas in the front yard. Steve, More haste, less speed! QWow, those drawing are gorgeous. I also love it that they are handmade and not something manufactured. Sheesh, they are really amazing and the whole celebration is fascinating isn't it? Candy, There are absolutely loads of festivals in the calendars of the Hindi and the other religions of India. It will be marvelleous over the next two years to be able to watch and participate in some of them. Hopefully I can pick up something about the mythology behind them and share that with you guys. So good they named it twice!